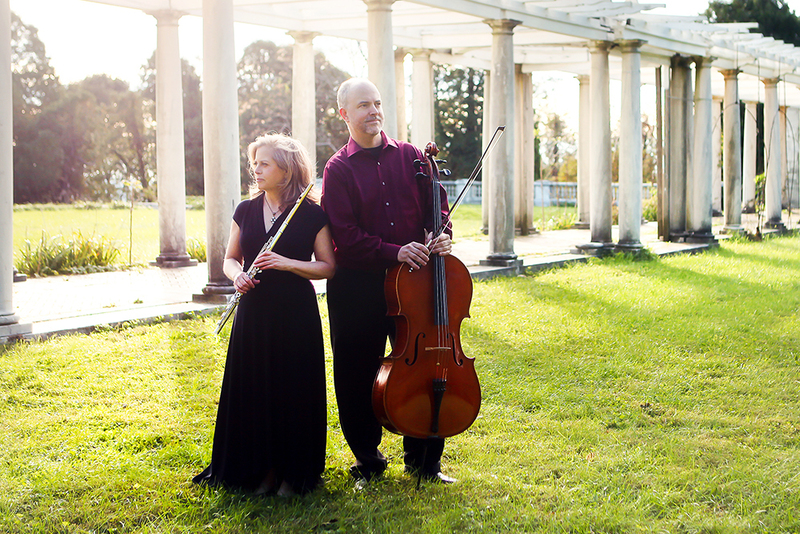 Eastern Mennonite University’s Department of Music hosts Terra Voce, the duo of Elizabeth Brightbill, flute, and Andrew Gabbert, cello, with Professor David Berry, piano. The concert is Friday, April 12, at 7:30 p.m. in Martin Chapel. Admission is free, with donations accepted for EMU’s music scholarship fund. The concert is part of the EMU Music Faculty Artist Series, sponsored by Whitesel Music, of Harrisonburg. The program “From the Old World to the New,” will feature the world premiere of the composition “light bearer,” by Professor Ryan Keebaugh, with other works by Marin Marais, Astor Piazzolla, Kari Juusela, Pixinguinha and Zhou Tian. Terra Voce, based in Charlottesville, recently released their third album, Água e Vinho. Brightbill held the position of Principal Flute with the Tulsa Philharmonic Orchestra and has performed with a number of other orchestras, including the Alabama Symphony, the Fort Wayne Philharmonic, and the Britt and OK Mozart Festival orchestras. She was winner of the National Flute Association’s Dissertation Competition, semi-finalist in the NFA Young Artist Competition, and 2nd Runner-up in the Myrna Brown Young Artist Competition. Her artistic pursuits with Terra Voce include performance of traditional and multi-cultural musical styles on a copy of the 19th c. Rudall & Rose simple-system flute made by John Gallagher of Elkins, West Virginia. Brightbill holds the Doctor of Music degree from Indiana University’s Jacobs School of Music and teaches at Longwood University, EMU, and her home studio. Prior to the creation of Terra Voce, Gabbert held titled positions with the Tulsa Philharmonic and Opera orchestras for eleven years. He has also performed as soloist with the Tulsa Philharmonic and the National Repertory Orchestra, and has recorded on Centaur Records as the Principal Cellist of the Chorus Civitas Orchestra. He has previously been a member of the Baton Rouge Symphony, National Repertory Orchestra and Terre Haute Symphony. Gabbert currently teaches at Mary Baldwin University, and maintains a private studio in Crozet and Charlottesville. A native of Syracuse, New York, Berry is a classical pianist whose performances have been featured in venues such as Carnegie Hall, Merkin Hall, the UW World Series at the University of Washington, as well as live broadcasts of WQXR (New York City). Recent concerto engagements have included appearances with the Shenandoah Valley Bach Festival Orchestra and the Hudson Symphony Orchestra. An avid chamber musician, he has collaborated with members of many of the nation’s leading orchestras, including the New Jersey, Houston, St. Louis, Dallas, and Seattle symphonies. He has toured and regularly concertized as a resident member of the Jacksonville, Florida-based Ritz Chamber Players, The Harlem Chamber Players, and the innovative chamber music theater group, the Core Ensemble. As an arts administrator, Berry serves as Chair of Chamber Music Programs for the Gateways Music Festival at the Eastman School of Music, a biennial festival which celebrates the contributions of musicians of African descent to classical music, and features over 120 players from major American orchestras and university faculties across the United States. He is also currently the president of the Harrisonburg Music Teachers Association. Berry received his Bachelor of Music with High Distinction from the Eastman School of Music, and Masters and Doctor of Musical Arts degrees in piano performance from the Juilliard School. Keebaugh ‘s choral ensembles have been invited to perform at international and national festivals, master classes, and historic locations including The Washington National Cathedral, St. John the Divine, New York University Steinhardt, The Kennedy Center, Carnegie Hall, Bruton Parish Church, and the Edinburgh Cathedral (Scotland). Since 2009, Ryan has often collaborated with American contemporary composers has distinguishing himself as an advocate for interdisciplinary collaboration in the arts, alternative venues and new commissions. Keebaugh has also maintained an active career within the marching arts. He has worked with several championship high schools band programs in Virginia, Pennsylvania, Indiana, and Texas as a music arranger, brass technician, and marching instructor. He earned a DMA at The Catholic University of America, a master of music degree at Shenandoah Conservatory and his bachelor’s degree from Bridgewater College.